I'm finally able to show off my sister's wedding quilt! I actually have a few projects that are safely with their new owners, and now ready to share. Unfortunately, I'm also consumed with getting ready for QuiltCon! 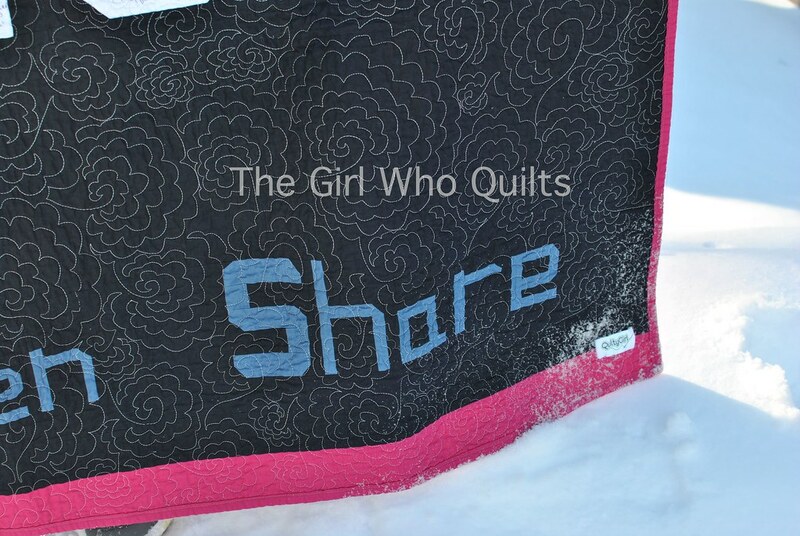 I started this quilt by designing the front. My sister designed her own invitations, and she had told me that she would like to carry the scallop design over to the quilt. Ultimately she gave me free reign (which I hope she isn't regretting!!). 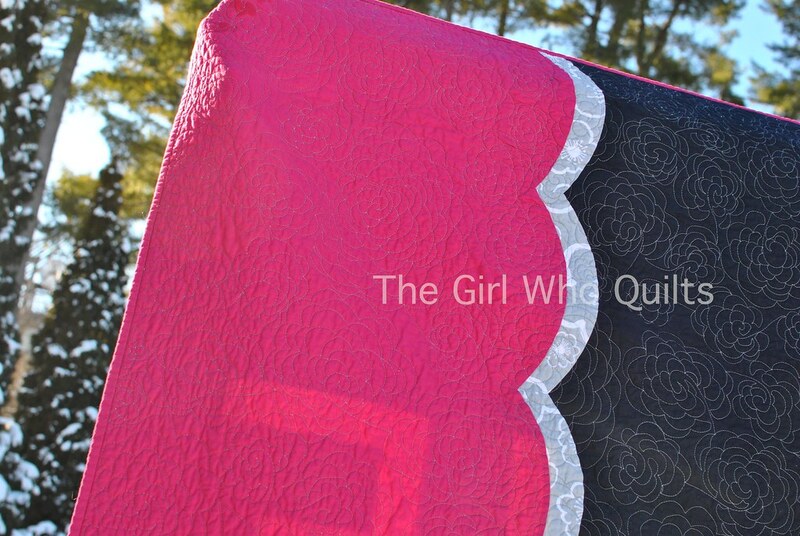 My initial idea was to keep it really simple with about 1/4 of the quilt being bright pink, the other 3/4 being dark blue, and joining the two colors with a scallop. Next I decided to throw in a bit of grey...I started with a solid, but ultimately decided to use a print from Bella. My next idea was to piece some wedding-ish words into the dark blue space. I carefully thought of 7 words, pieced them, and then couldn't find an arrangement that I was satisfied with! 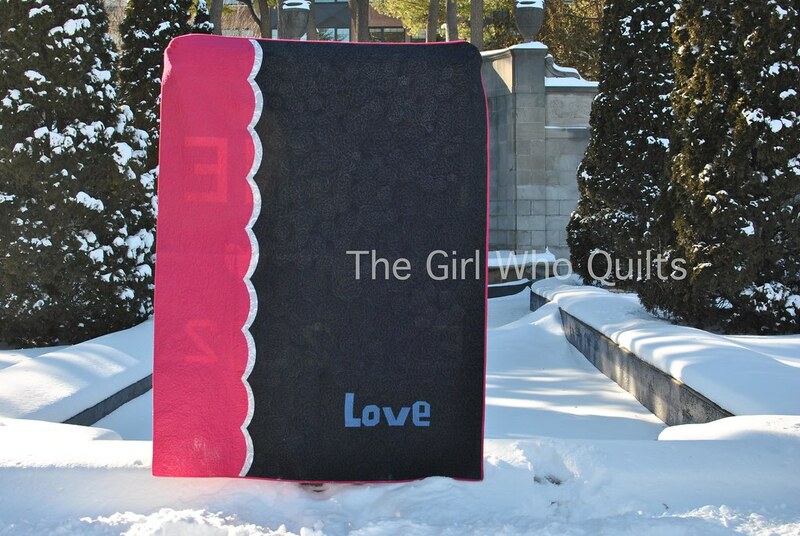 As you can see, I kept just one word on the front of the quilt. My sister and I brainstormed a lot on how to incorporate the wedding guests' signatures into the quilt back. 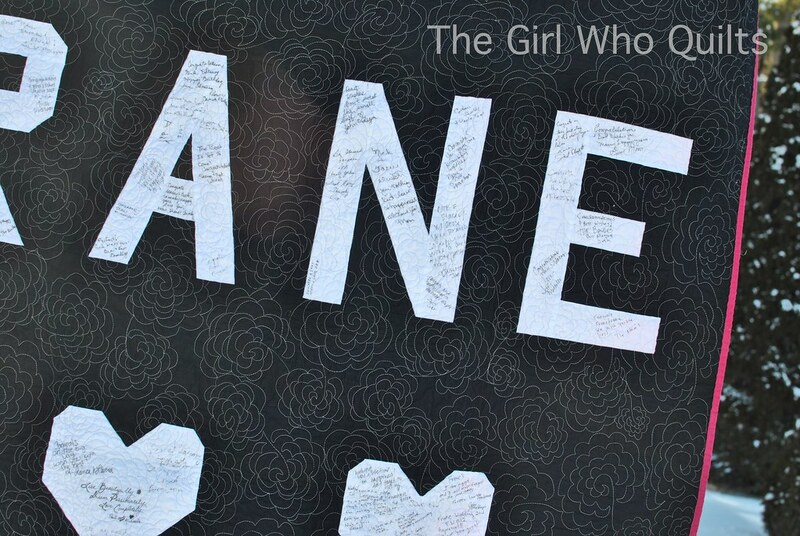 She liked the idea of the signatures being a part of the quilt, but not in a traditional signature quilt style. I ended up paper piecing blocks of letters, numbers and hearts (which would later spell out their last name and wedding date) using freezer paper as a foundation. I took the individually pieced blocks with to the wedding, where we asked the guests to sign them. Most of the guests also chose to include a short message, which made it even sweeter! When I had all of the blocks back home, I started to think about how to arrange them. 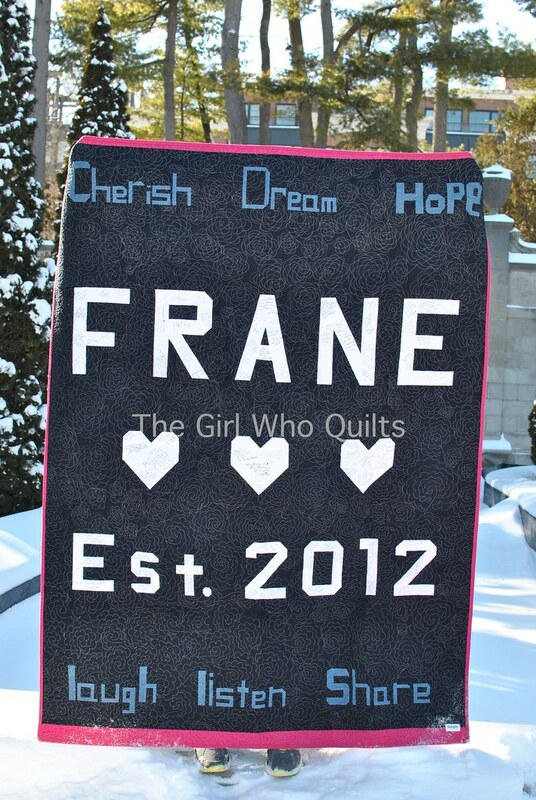 The back design came together really easily, and it seemed perfect to use the abandoned words from the quilt front on the back! I used a dark grey thread (Aurifil, # 2625 Pigeon) on top and a lighter grey (Aurifil, #2615 Pearl Grey) on the back, so as to keep the signatures and messages readable. I really love how the grey looked on the pink! The quilting design got easier as I went along, although I still need lots of practice! In the end, I do love how the quilt turned out. I hope my sister and her husband love it, too, and use it often! Fabric: Michael Miller Cotton Couture Solids in Magenta, Indigo, Bright White, and Denim - These solids are SO soft! And the color range is great!